Track your progress with the FREE app! The Kerry Gaynor Method free app works with The Kerry Gaynor Method video sessions, which has helped thousands of people quit smoking including Martin Sheen, Aaron Eckhart, Kevin Pollak, Emily Procter, Katie Cassidy and Jerry Ferrara. Throughout your participation in The Method, this app will track your progress during your journey of becoming a non-smoker for life. The app will help you stay on track through the process with helpful reminders and updates. You will also be able to keep track of how much money you're saving by not smoking cigarettes. This app will support you during, and even after, you've completed The Kerry Gaynor Method. This app was designed as a "wingman" to The Kerry Gaynor Method program. It's still fun and informative on it's own, but paired with The Method it's an even better tool and support system. Once you have the The Kerry Gaynor Method, watch Session 1. Afterwards, hit the "Start" tab to enter in your Session 1 completion date. The Method app will help you stay on track throughout the course of your journey with helpful reminders and updates to your calendar. After your second Session, the "Smoking Calculator" will be your new addiction. 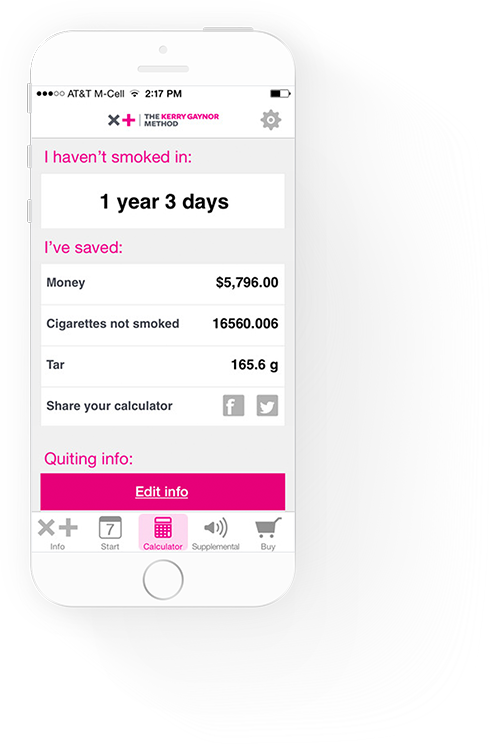 This calculator lets you track exactly how much money you've saved, how many cigarettes you haven't smoked and even how much tar your body has been spared. You'll be amazed at how much money you are going to save by quitting smoking. You will receive a code in with your physical kit, or if you've purchased the online session videos you will receive the code in a follow up email. Your smoke free life starts here. * Actual results may vary. Please consult a doctor before starting any smoking cessation program. This is not a substitute for medical advice or treatment. ** Within 30 days of purchase, see Amazon terms and conditions for the Limited Edition Collection and see streaming options terms and conditions for the streaming video. † Evaluated in an environment similar to what you will experience at home, The Method has an 85% success rate in our internal testing. ¤ These statements have not been evaluated by the FDA. This product is not intended to diagnose, treat, cure or prevent any disease. Consult your physician before taking this product. Actual results may vary. ‡‡ WellTrim® iG is a trademark of Icon Group, LLC IGOB131® is a trademark of Gateway Health Alliance, Inc. and is protected under US Patent 7, 537, 790. Sign up to receive updates on new products and videos.